We are engaged in providing an extensive range of carbide welding blades that are characterized by tensile strength, abrasion resistance and excellent performance. Our carbide brazed tips or carbide brazed blades are widely used in rolling mills and alloy industries. They are precisely designed by our senior engineers and the materials used in the production are acquired from reliable providers. Carbide welding blades are available in various configurations and specifications. We offer a full variety of carbide brazed tips based on ANSI and ISO standards. Our company also provides customized services to clients. Recommended grades include K05, K10, K20, K30, P10, P20, P25, P30, M05, M10 and M20. 1. Tongyi carbide welding blades are famous for their high hardness, perfect toughness, high wear resistance and welding ability. They can maintain perfect cutting capability under high temperature. 2. Our carbide brazed tips are produced in our own factory and strict quality control is promised. 3. All kinds of carbide brazed blades are available in our company. For those we do not have in stock, we are able to produce in a short term. 4. Our company can manufacturer carbide welding blades have smooth and uniform surface. No pore, black core, crackle, burr and slice can be found on them. 5. Samples and quotes of our carbide brazed tips are available if they are required. Carbide welding blades are suitable for the finishing and semi-finishing of cast iron and non-ferrous metals, and rough machining of light alloys. They can also be used for the milling of manganese steel, quenched steel and low alloy steel. The following table shows the recommended grades of carbide brazed tips and their applications. K05 This carbide welding blade is suitable for fine finishing of cast iron and non-ferrous metal. K10 It is well suited for finishing and semi-finishing of cast iron and non-ferrous metal. It is also used for machining manganese steel and quenched steel. 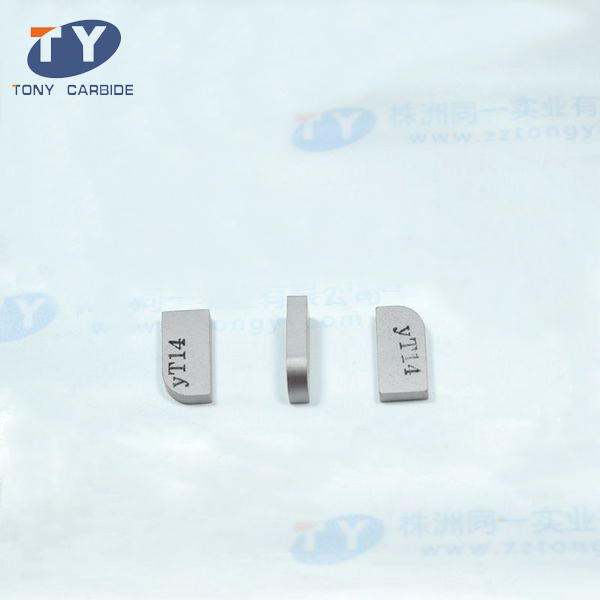 K20 This carbide brazed tip is suitable for finishing and semi-finishing of cast iron and light alloy, and milling of cast iron and low alloy steel. P10 This carbide welding blade is used for finishing and semi-finishing of steel and cast steel. P20, P25, P30 It is suitable for finishing and semi-finishing of steel and cast steel. YS25 This carbide brazed tip is specially used for milling of steel and iron steel. M05 It is suitable for the finishing of iron based alloy, nickel based alloy and high-strength steel. M10 This carbide welding blade is used for finishing and semi-finishing of stainless steel and common low alloy steel. M20 It is suitable for semi-finishing of stainless steel and low alloy steel. 1. Carbide brazed tips must be of enough rigidity. The maximum dimension, higher steel grade and heat treatment make it possible. 2. Carbide welding blade should be fixed tightly. The shapes of grooves should be selected according to the shape and geometry parameters of carbide brazing tips. 3. Examine cutter bar carefully before operation. Make sure the bearing surface is straight and the carbide brazed tips are clean. 4. Select suitable welding flux, soldering flux and net shim. Founded in 2002, Zhuzhou Tongyi Industry Co., Ltd. has quickly become an important manufacturer and supplier of carbide welding blades in China. We offer a wide range of carbide products, including tungsten carbide bits, carbide drawing dies, carbide tips, etc. We can also manufacture products according to clients’ specifications. Our products are popular at home and abroad and are exported to many countries like South-East Asia, South America and the EU.